Sometimes young students need a little inspiration to begin writing a story. Have them use Start With a Character by I-Board. Students can choose a face, expression, and outfit. 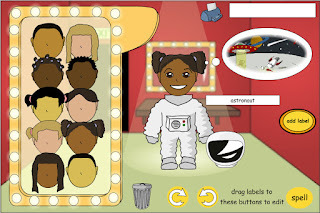 If you are using this resource on a Smartboard, the teacher could add labels to assist students with spelling difficult words related to their character, such as astronaut. I-Board also has other great story starting resources to use: Start With a Setting and Start With Speech.